Thoughts on Attending RAADfest 2018 in San Diego – Fight Aging! I spent an interesting few days last week attending RAADfest, and came away somewhat optimistic that this strange collision of subcultures may herald an acceleration in the adoption of solid science and working therapies on the part of the anti-aging marketplace, accompanied by a driving out of the ineffective nonsense and fraud of past decades. This sea change is very much a work in process, and there is plenty of that nonsense still to be found. Yet the advent of senolytic therapies to clear senescent cells has clearly invigorated certain groups, who have now turned a sizable amount of their advocacy and attention to the adoption of this first legitimate rejuvenation therapy, an implementation of the SENS model of damage repair. RAADfest is a stage show of presentations and a floor show of company booths. The core of RAADfest, the presentations on stage, might be best understood as almost a secular church, an adoption of the methods of American revivalism when it comes to firing up an audience, presenting a message, and encouraging people to set forth and tell their friends the good news. The presenters are effusive and largely very charismatic characters, the audience leaps up to applaud and shout encouragement. There are few other places you will see scientists gain a standing ovation and rousing cheers on presenting patient benefits, or explaining how their work will help in the future. The hosts, the leaders of the Coalition for Radical Life Extension represent a community of long-standing longevity advocates and their followers, associated for decades with the anti-aging marketplace, the original iconoclasts from an era in which the scientific community was much more hostile to the message of longevity. Among them are some of those who built the original businesses such as the Life Extension Foundation because they believed that more could be accomplished than was possible at the time. Where businesses succeeded, they ended up selling at best marginal and ineffective products, hoping for a better future, and coming to be surrounded by an industry in which the fraud of false promises became a way of life. So what happens when real, working rejuvenation therapies start to show up? I hope that the good drives out the bad, and that process seems to be underway. The past generation of longevity advocates, those who built an audience and a logistics pipeline, now have a chance to redeem themselves. Still, there is an element of the tragic here, in that these people have adopted a mode of advocacy that does not allow them to admit that there is the slightest chance that they will not make it, that the pace of process will be too slow. Technology cannot advance fast enough to save today's oldest demographic, and their only realistic option is cryopreservation (Alcor had a booth, and good for them). There is a certain pathos in folk in late life standing on stage to call for radical life extension, to say that they are fully engaged with living a great life, that they wish to live forever and have fun doing it. In the process they are doing good in the sense of aiding the advance of rejuvenation therapies in their own way, but it is clear that they will be not be around for long enough to see the true flowering of this field of medicine. On the topic of senolytics, I took a sizable number of handouts to the conference and distributed them all. 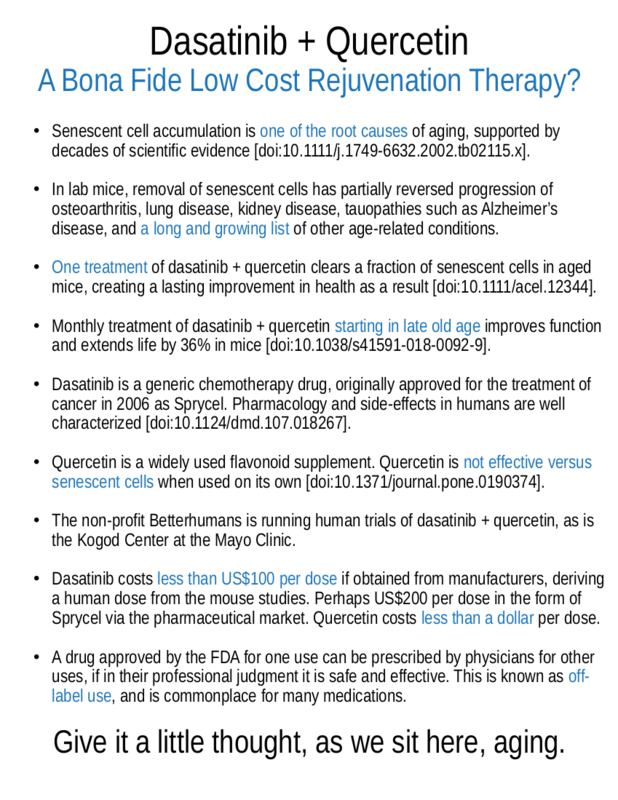 I feel quite strongly that it is crazy that so little progress is being made in getting the senolytic dasatinib to the tens of millions of older people who might benefit significantly from even a single dose, given that it is a cheap, easily available, FDA-approved generic drug with well characterized pharmacology that can be used off-label. Millions are suffering needlessly, and they and their physicians just need to be told of the opportunity in order to assess it and take advantage of it. As it turned out, no such effort on my part was actually needed, as the formal conference materials contained a fairly comprehensive section covering senolytics, featuring the dasatinib and quercetin combination front and center. The position put forward by Bill Faloon of the Life Extension Foundation at the conference is that older people should absolutely be taking advantage of NAD+ boosting therapies such as nicotinamide riboside, then senolytics, then mesenchymal stem cell therapies, in that order, envisaged as an ascending stairway of benefits. There is good evidence to suggest that positive results for older individuals will result from all of these, though senolytics are by far the most impressive in animal studies. I'm omitting the presence of basic good health practices and supplements in this stairway picture, but they are still there and being emphasized. That said, I have to think that they will drift away from being as central to the anti-aging message as they have been in the past, as the biotechnologies improve. I had said this was a collision of cultures. The older longevity advocates of past decades are the organizers, and then into the big tent are invited scientists developing the foundations of real, working rejuvenation therapies; investors funding the latest startups; entrepreneurs commercializing the range of new approaches to treat aging; the transhumanist community with its focus on transcending human limits; health advocates of all varieties; stem cell physicians of the proven and unproven variety, and of course the strange detritus of the anti-aging marketplace, a mix of cynics and true believers offering little more than hope and strangeness, ineffective products wrapped in the veneer of science. It is quite the mix. One might hope that out of this cross-pollination perhaps an acceleration will emerge, a speeding of the otherwise slow process of outreach and awareness in the matter of longevity science. It was certainly the case that I met a couple of interesting new faces, people undertaking or considering what I see to be worthwhile endeavors. Among the presentations of note, Aubrey de Grey gave an update on the growing number of companies now emerged from or associated with the SENS Research Foundation community (a list that includes the startup Repair Biotechnologies, founded by Bill Cherman and myself). The audience here might find it very interesting to note that Revel Pharmaceuticals, the glucosepane cross-link breaking company in the lengthy process of being founded by David Spiegel is apparently now funded by Juvenescence and Kizoo Technology Ventures. So it looks like we'll be hearing more on that front soon, and a good thing too, as this part of the SENS rejuvenation research agenda is likely to be just as big as senolytics once realized. Bill Andrews gave an interesting update on progress towards human trials of telomerase gene therapy at Libella Gene Therapeutics; the technology is coming together. Liz Parrish of BioViva was also present at the event to discuss her company and present efforts. Gene therapies are still a pain to develop, to optimize sufficiently to gain high levels of transduction of target cells. This will change in the years ahead, but for now it is still an expensive and complicated business to deal with all of the issues that arise, and every therapy is significantly different in its needs, a hand-crafted product unlike any of its peers. I remain in the camp of wait and see on telomerase therapies; my concern is the sizable difference between mouse and human telomere dynamics. Were I older, the risk/reward calculus would be different, but I have to admire the brave souls who have undergone or will in the near future undergo these therapies. Their risk-taking benefits all of us. Vocal investor Jim Mellon, who at times appears to be more or less single-handedly driving the funding of our nascent rejuvenation biotechnology industry, gave a rousing presentation. Longevity is a market that will make every past growth trend and bubble seem tiny. Mellon doesn't care about the money, save as a means to an end - "I have enough money" - but rather he wants to see the job accomplished, rejuvenation realized, life spans extended by decades and more. The best way to do that is to build an industry large enough and vibrant enough and sufficiently well known to draw in a flood of capital, packed with enough companies to develop every possible portion of and take on the SENS rejuvenation research portfolio that we can come up with. As he points out, the anti-aging market, selling things that don't work, is worth $140 billion today. How much will it be worth when the products do work? Over the timescale of decades, it is large and healthy industries that truly change the world. These are interesting times that we live in. That's a great poster on the dasatinib + quercetin combo, I've printed a few to give out myself. I wonder how far along Revel are in their testing? And how they have conducted any in vivo testing? @Jim: Anyone's guess at this point. They will be quiet until they are not. "Still, there is an element of the tragic here, in that these people have adopted a mode of advocacy that does not allow them to admit that there is the slightest chance that they will not make it, that the pace of process will be too slow." Tell me about it. I'm old enough to have witnessed about three generations of "life extension" magical thinking and charlatanry, starting in the 1970's. And yet the people who spread these delusions die pretty much on schedule like everyone else. I have mixed feelings about this conference. I hope it finally develops into a more sound medical meeting, but I'm not too optimistic. Very good handout, btw. And nice to hear that Revel is finally reaching the final stages of foundation. Great link to that 1970's article.. a futuristic thinker for sure, yet he over-estimated how much could be done in the short term. A positive development since that 1978 article was the super growth of the pharmaceutical industry during the 80's and 90's. The R&D budget today of the world pharmaceutical industry is something like $140 billion. Add to that Big Pharma's regulatory affairs, manufacturing, distribution and marketing infrastructure. It puts in place the infrastructure needed when the advances are made, to commercialize innovations on a very large scale. How old are these people on stage if they are too old to benefit? Is it a bunch of 80 something's jumpingg around up there? A remarkable feature of that 1978 article is the absolute lack of any scientific content. Apart from cryonics, there is no mention at all to any method by which that life extension would be achieved, only "this guy says we will achieve X years", "this other one says Y years", etc. @Jim: A couple of 80+ year olds in the group, yes. A 50 yr old who was particularly unlucky in the genetic lottery could be too old to benefit (cough me cough), whereas some 80+ yr olds, especially the active and engaged ones, might live another 20 years sans rejuvenation therapies. I wouldn't read too much into the bloated budgets of today's pharmaceutical companies. It is widely acknowledged that new drug development is well into diminish returns. I also wouldn't hold out hope that a company like Google can make breakthroughs in life extension, either. As that recently leaked company video suggests, Google is full of snowflakes and rent seekers, not people who are competent and driven to solve hard problems. What happens at big corporations like Big Pharma or Google is they become too big to innovate. On the other hand, both Big Pharma and Big Tech have found a way around this, its that they simply buy up smaller companies that have developed an innovation. This creates a marketplace for venture capital funded start-up type corporations. What Big Pharma is really good at is taking innovation and commercializing it. For example moving through the regulatory process in dozens of nations at once is a complex task. Heck, even moving through the regulatory process in the US, Europe & Japan are complex, long undertakings. I am not convinced yet that new drug development is into diminishing returns. I have read numerous arguments about it, but now I am not sure. Just look at what may be possible with clearing senescent cells. My gut feeling is that small molecule drugs are the way to go. As Comms Dir. for RAADfest I appreciate you covering the event, and many of your observations above. RAADfest does indeed bring together all kinds of people with interests and expertise related to longevity, allowing participants to choose what they find most meaningful. The good news is that options exist, and that they are more plentiful this year than last year, and generally on the increase. Regarding the element of tragedy, I would point out that is built in to the human experience by aging itself. We are all already living out a tragedy. Given that, what do we have to lose by believing we can transcend it? Nothing, really. Also, a person aged 80 today, with a good foundation of health, can do a lot to extend that health another ten years, by which time they may reasonably expect more help to have arrived on the scene. And beyond that more help. I'd say that's something to get excited about. Thank you Reason for the article and the (excellent) chart and yes, emphasizing the element of tragic! I am sure most of you know about the possibility the ResqueElders initiative offers for testing, incl. at 0 cost for participation, Dasatinib+Quercetin. Does anyone take the combo and which are the biomarkers you follow for possible side effects and/or effectiveness?